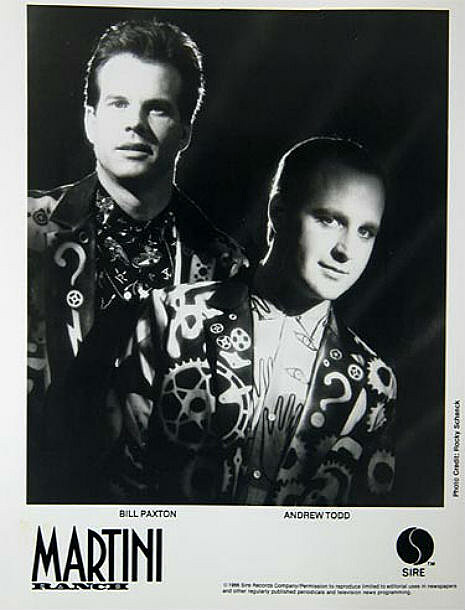 While best known as an actor, including a starring role in HBO’s Big Love, and appearances in many of James Cameron’s films (Aliens, The Terminator, True Lies, Titanic), among many other roles (Chet in Weird Science), Paxton was also a musician who was one half of New Wave duo Martini Ranch whose 1988 debut album, Holy Cow, was released by Sire Records and is fun in an Oingo Boingo/Devo kind of way. In fact it featured musical appearances by most of Devo, as well as Cindy Wilson of The B-52s and, weirdly, Judge Reinhold. Their videos were especially good and “Reach” is a spaghetti western tour-de-force that was directed by James Cameron and also features director Kathyrn Bigelow (who would marry Cameron in 1989) as a member of a rival gang. You can watch that and the video fort “How Can The Labouring Man Find Time For Self Culture?” (directed by Rocky Schenck and featuring Paxton’s Weird Science co-star Anthony Michael Hall) as well as stream the whole Martini Ranch album, below. He also starred in and co-directed Barnes & Barnes’ video for their cult/Dr. Demento classic “Fish Heads.” Watch that below, too. Rest in peace, Bill. You’ll be missed.